This comprehensive 800 page sourcebook for grades K-8 includes research based information as well as practical hands-on teaching models for all aspects of explicit reading instruction. No matter which reading program you are using, this resource will help you to provide effective instruction to students with diverse needs. 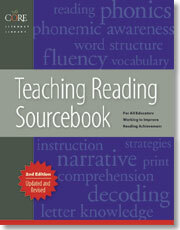 Word structure, decoding skills, spelling, vocabulary, comprehension, and other areas are covered.